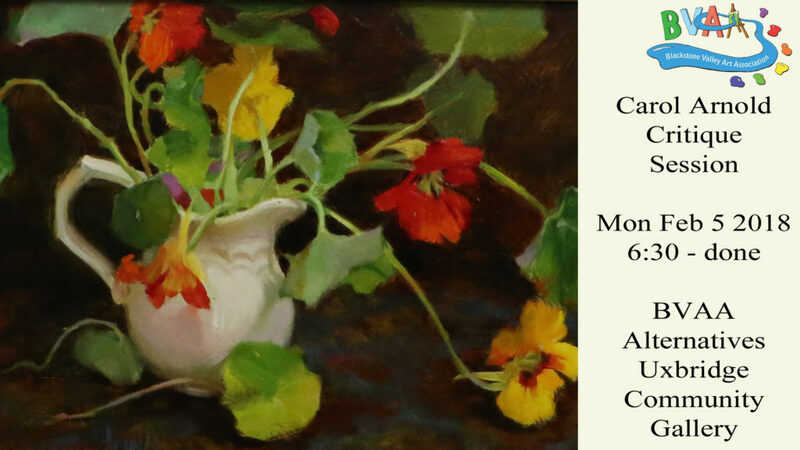 Carol Arnold, a member of Richard Schmid and Nancy Guzik’s Putney Painters, is starting a monthly critique session at the Uxbridge Gallery on the 1st Monday of each month. The session will start at 6:30pm and run until all works are fully discussed. You can bring in 2-3 pieces of work in progress for a learning critique. This is open to the public. There is a $5 fee to have your works reviewed. The cost of the workshop is $5 for 2-3 paintings. It is open to the public. Please make sure you register beforehand so we know how many to expect. The featured artist for this workshop is Carol Arnold.